Throughout history, the ratio for length to width of rectangles of 1.61803 39887 49894 84820 has been considered the most pleasing to the eye. This ratio was named the golden ratio by the Greeks. In the world of mathematics, the numeric value is called "phi", named for the Greek sculptor Phidias. The space between the collumns form golden rectangles. There are golden rectangles throughout this structure which is found in Athens, Greece. He sculpted many things including the bands of sculpture that run above the columns of the Parthenon. You can take a slide show visit to the Parthenon which is pictured above. Phidias widely used the golden ratio in his works of sculpture. The exterior dimensions of the Parthenon in Athens, built in about 440BC, form a perfect golden rectangle. How many examples of golden rectangles can you find in the below floorplan of the Parthenon? You may want to print the diagram and measure the distances using a ruler. Following are more examples of art and architecture which have employed the golden rectangle. This first example of the Great Pyramid of Giza is believed to be 4,600 years old, which was long before the Greeks. Its dimensions are also based on the Golden Ratio. The website about the pyramid gives very extensive details on this. Many artists who lived after Phidias have used this proportion. 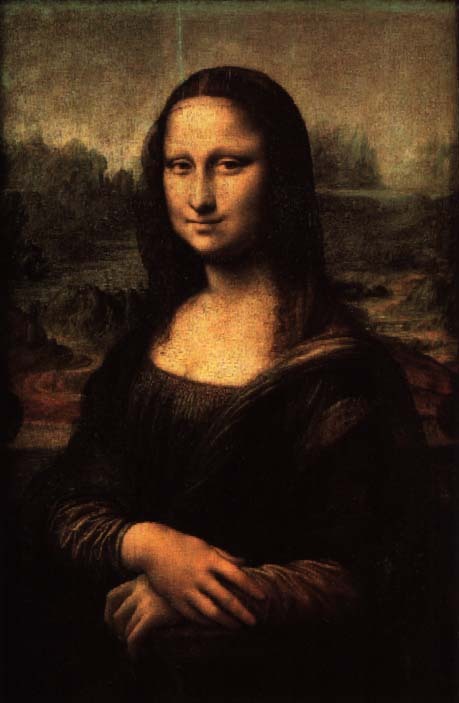 Leonardo Da Vinci called it the "divine proportion" and featured it in many of his paintings. To the left is the famous "Mona Lisa". Try drawing a rectangle around her face. Are the measurements in a golden proportion? You can further explore this by subdividing the rectangle formed by using her eyes as a horizontal divider. He did an entire exploration of the human body and the ratios of the lengths of various body parts. Above is an example of a modern day artist who is interested in the golden ratio. He titled his work the Golden Section which is simply another name for ratio, meaning it is cut into sections of golden proportion.